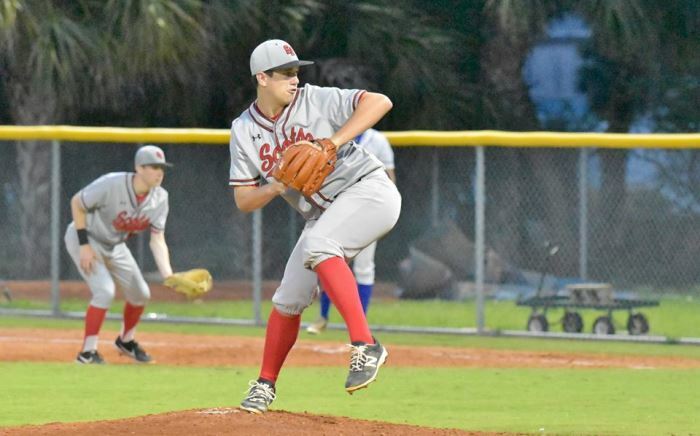 Cardinal Newman (6-6) won a pitching chess match Thursday evening against visiting Saint Andrew’s Scots (4-7). 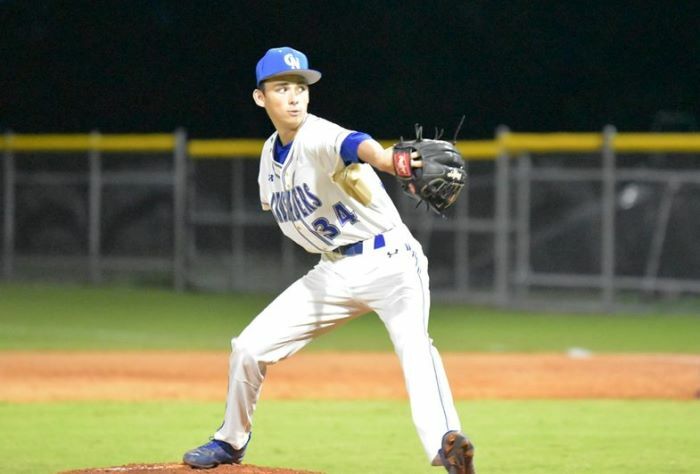 Reliever Chase Romaine entered the game in the top of the fifth inning and was practically impenetrable, recording a game-high eight strikeouts — he held off the Scots offense until the Crusaders were able to break though in the bottom of the ninth for the 2-1 victory. The low-scoring affair was filled with defensive showmanship, but the scoreboard first showed signs of life in the bottom of the second inning. Michael Dupont reach first via hit-by-pitch, stole second, and advanced to third on a groundball from Roman Anthony. Jacob Connley delivered the first run of the game with a single, scoring Dupont for the 1-0 lead — but though he also stole second base, Scots starting pitcher Hayden Carson ended the threat with back-to-back timely strikeouts. It was in the top of the fourth inning that the Scots struck back. Cole Derks singled, Hilton Johnson and Chase Bloom reached on hit-by-pitches — the second and third plunks of the game between both starting pitchers — and then Derks raced home on a passed ball to knot the game at one run apiece. Otherwise, it was a defensive stalemate as both defenses went to work. It was not that the teams did not have their respective chances at the plate. But the timeliness of both teams’ pitching staffs was uncanny. Both the bottom of the second and the top of the fourth could have been far higher-scoring had it not been for inning-ending strikeouts. The closest the game came to a broken tie in regulation came in the bottom of the fourth inning, when Anthony crushed a line drive to center field. 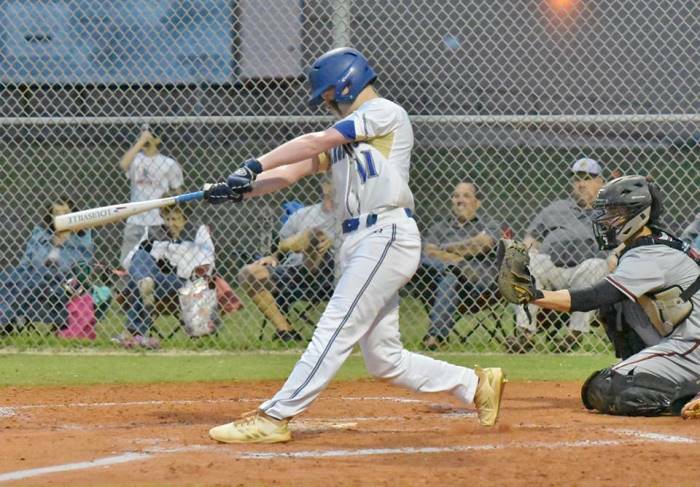 He blitzed the bases, burning rubber around the second-base bag on his way to a lead-off triple, but the Scots defense combined for pinpoints throws to nail him at the bag. With the score still tied. when the Romaine came in for the Crusaders, the Scots offense chances nearly vanished. Though they managed to get two men on in the top of the sixth, he quickly stifled the opportunity with back-to-back strikeouts. His eight strikeouts become even more intriguing when learning of his history with the team. Coming off of an ankle injury that dismantled his 2018 season, Romaine wasn’t even training to be a pitcher until the team was short of staff arms entering the 2019 season. If this game was any indication, the coaching staff found a hidden gem amid their roster. The game ended on an unexpected note. Diego Clariot hit a lead-off single for the Crusaders. Then, both of the Scots’ middle infielders came in for a quick meeting with the pitcher in the bottom of the ninth — that was when Clariot took off and swiped an unoccupied second-base. “We weren’t sure if he called time or not, so just to make sure, I took off,” Clariot said after the game. No timeouts were ruled called in the confusion, and after a bunt single from Romaine, he scored on a passed ball to end the game. Following the 2-1 win in extras, Crusaders Manager Poston expressed the importance of the district win, noting that the Scots’ impressive defensive play had certainly given them a run for their money.